We consider ourselves to be experts in the world of Air Conditioning. We offer a complete air conditioning recharge service and we supply a whole range of products, from a host of suppliers including; Condensers, Compressors, Filters, R134a gas. Our fitters have over 15 years experience in the field. So if you require a service or repair to your air conditioning system we can help. Over 2/3 of vehicles are fitted with air control systems as standard nowadays. 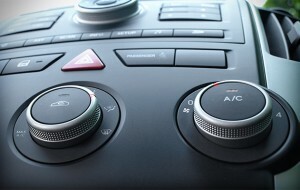 Car manufacturers recommend your Air-Conditioning system, is recharged with gas and lubricant every 2 years. Although this service is not part of your routine vehicle servicing. Pop in to our workshop and within an hour the whole recharge process will be completed. The process can also include a system de-bug, this is to clear bacterial build up within the system, which will remove any awful odours. If your Air-Conditioning system is not fully recharged, it will be less effective and have to work harder, which puts more strain on the engine, using more fuel. By not having your Air-Conditioning system recharged, can dramatically reduce efficiency. VAC + Re-Gas = £40 plus VAT (includes: VAC + Re-Gas Only). Full Air Con Service = £70 plus VAT (includes: Pressure Test, Vac + Re-Gas including Oil and Dye, Pollen Filter Check, Compressor + System Oil Check, Air Con Cleaner added to system). Pressure Test = £25 plus VAT (All vehicles with NO gas in system require a pressure test). Labour Rate on Repairs = £40 plus VAT per hour. Kent Air Con Cleaner = £17 plus VAT per tin. UV Dye = £10 plus VAT. Oil = £5 plus VAT. O Rings = £2.50 plus VAT. For Commercial, Plant, Agricultural Air Con = Please Contact Us. In the summer months we use the Air-Conditioning system more, so to keep your Air-Conditioning system fully charged/serviced all year, call in to Kings Lynn Auto Electrical or we have a portable Air Conditioning machine, so we can always come to you (a call out charge may apply).